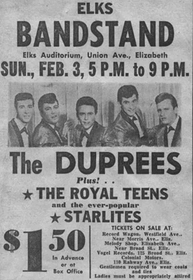 If Glenn Miller and his Orchestra were backing acts like THE HILLTOPPERS or THE FOUR PREPS in the early '60s on song standards, the results probably would have sounded like the Duprees. This teen quintet from Jersey City, New Jersey, made every ballad sound like an old standard. 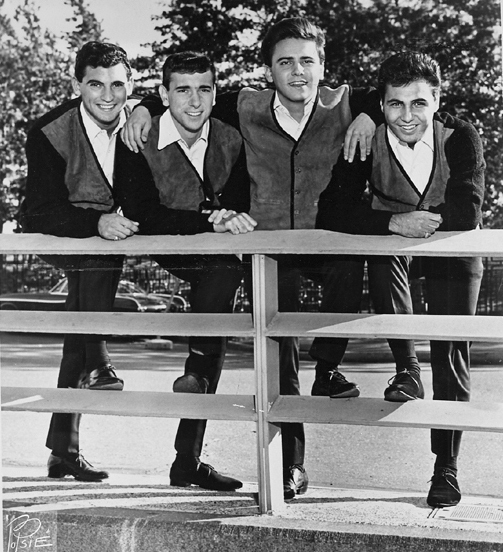 In 1956, 16-year-old Tommy Bialoglow and 13- year-old Joey Canzano formed a group with three black teens that evolved into the Utopians with Joey (lead), Tom (tenor), Jackie Smith (tenor), and Brian Moran (bass). 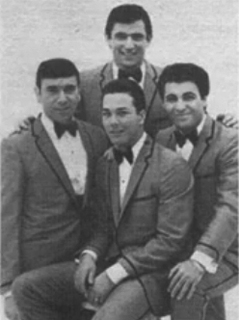 By 1959 Joey and Tom had formed the Parisiens with three members of another vocal group, Joe Santollo (16, tenor), John Salvato (19, tenor), and Mike Arnone (16, baritone). Canzano was soon going by the name of Joey Vann, and the Parisiens were becoming proficient at performing standard ballads. 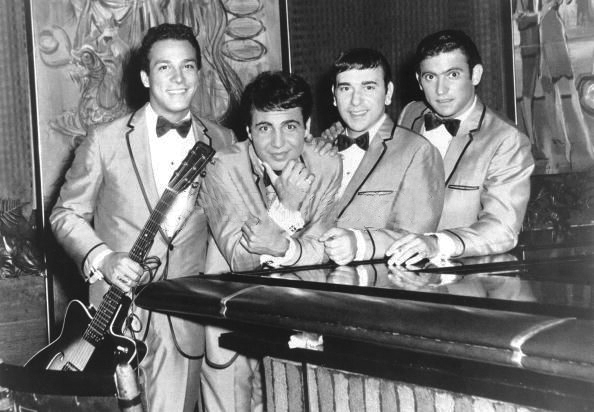 The group recorded a demo tape that included "My Own True Love" and "As Time Goes By," and in 1962 it was sent to Coed Records. 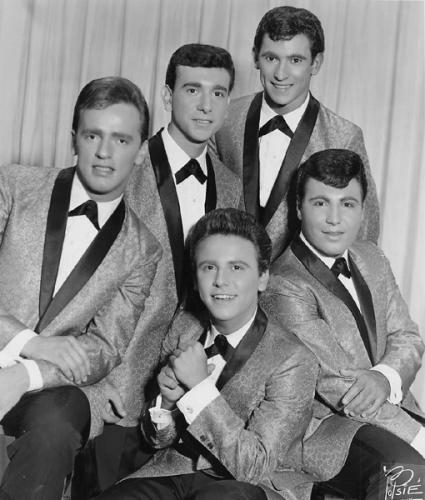 Coed's owners, Marvin Cane and George Paxton, liked their harmonies and signed the group. 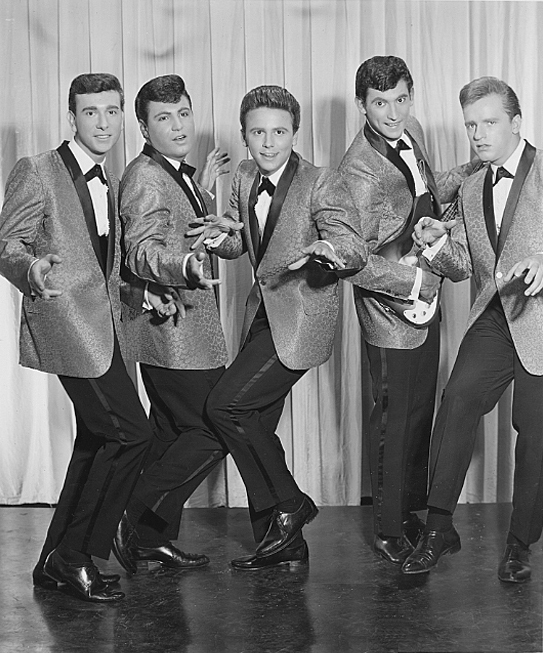 Coed had turned out hits with THE CRESTS and THE RIVIERAS in the late '50s, and their success with groups was well-known. Cane and Paxton weren't interested in changing this group's musical direction, but they did want the boys to change their name . Trying to keep a French sound, they named themselves after an old black singer named Dupree. 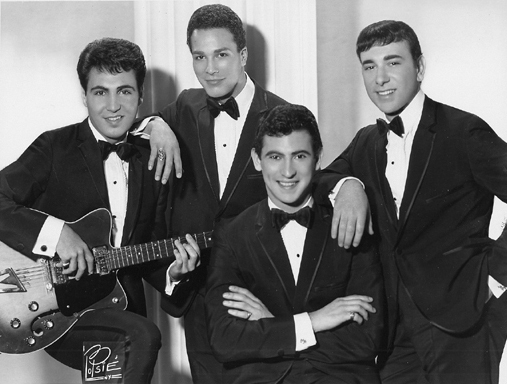 Their first single was "You Belong to Me," a warm-sounding version of the Jo Stafford hit from 1952. With its Glenn Miller-styled orchestration it soon breached the Pop charts, hitting number seven the week of September 22nd. 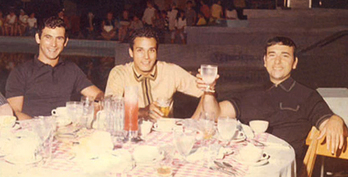 One of Joey Canzano's finest performances was on their second single, "My Own True Love" (Tara's theme from Gone with the Wind) in which his voice rivaled that of Jimmy Beaumont of THE SKYLINERS. 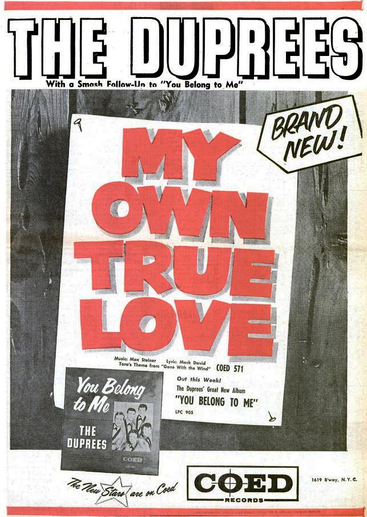 "True Love" made it to number 13 in the holiday season of 1962. 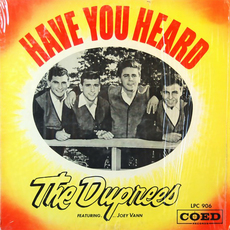 The Duprees generated mediocre chart action until Coed had them record another 1952 gem, the Jonie James number one hit "Why Don't You Believe Me." It reached number 37, prompting them to dip in to Jonie James's repertoire yet again. They reworked her 1953 number four hit "Have You Heard." 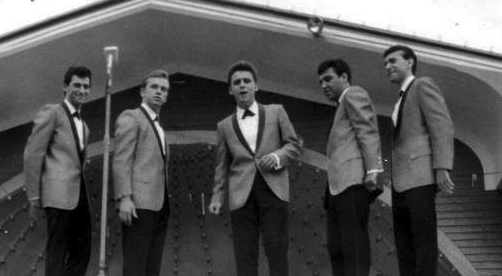 It got them back on track at number 18 around Christmastime 1963 and was their last top 20 single. The group became a quartet following Tommy's departure in November. 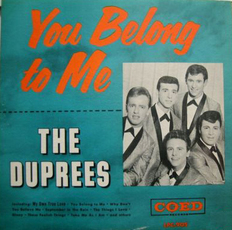 By mid-1965 the Duprees had moved to Columbia Records and totally changed their style thanks to an Artie Ripp-produced tune titled "Around the Corner." 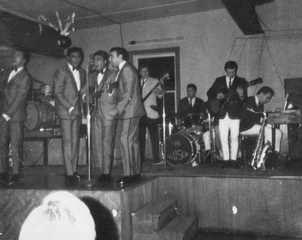 Sounding now like JAY AND THE AMERICANS, the Duprees rode "Around the Corner" (a cross between THE DRIFTERS' "On Broadway" and the Americans' "Come a Little Bit Closer") to number 91 in the summer of 1965. 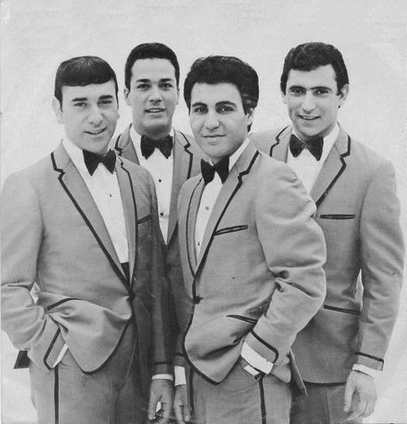 The group recorded four more singles for Columbia through the spring of 1967 but none charted. The best of these were two Jay and the Americans-styled songs, the uptempo "She Waits for Him" and an interesting ballad of "The Exodus Song. 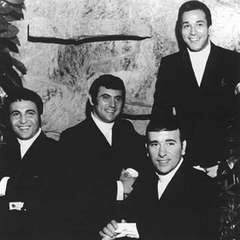 In 1968 they signed with Heritage for four singles that placed them somewhere between their old and new sound. By 1970 music had changed so much they thought a new name might give them a fresh start and a chance to change musical directions. Deciding to drop their French name and emphasize their national origin, they renamed themselves the Italian Asphalt and Pavement Company. 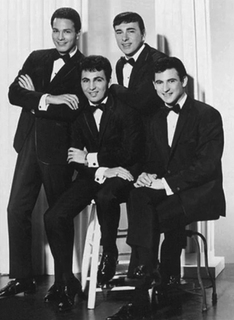 Their single "Check Yourself" got enough sporadic East Coast play to reach number 97 Pop before disappearing. In 1980 Joey Vann returned to the music world as lead of a new vocal band, Vintage, recording a Duprees medley titled "Joey Vann Medley" under his own name on Chubby Records in the summer of 1982. Joe Santollo died in 1981 of a heart attack at the age of 38. Joey Vann and his gifted voice were stilled on February 28, 1984, at the age of 41. 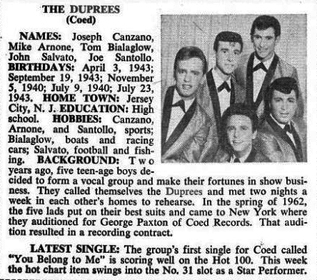 As of 1989 the Duprees were still performing in the New York, New Jersey, and Connecticut aera .